1. Is it an L series neckplate/serial number? Can't tell from pix. 2. Any writing or dates on underside of the pickup bobbins? Black or gray bobbins? 3. Any relief holes routed under the tuners to allow for a flush setting? 4. Can't see pix of bridge. Grooved saddles? 5. Are dot inlays clay or faux pearl? Grey bobbins. Writing is not really ledgable. The same decal was used from 62 to 68. This bass is 100% and I will guarantee it. Check out this 1964 P Bass on ebay. It has the same decal as this lefty. That '64 righty bass looks like the decal is on top of the finish doesn't it? Maybe a refin? Documented by who? I can't cite a source that would show that image to be in error nor can I attest to the validity of it either. I don't believe everything I read on the internet. The fact that the other righty 64 on Ebay has the same decal kinda makes this 2 against 1. Not looking for an argument but I have held 100s upon 100s of cherry vintage guitars in my time and I have NO doubt that this guitar is 100 percent and challenge anyone to come with positive proof that it isn't. That doesn't include sites on the internet where someone attesting to be an expert posts something that he says is written in stone. I have seen a 63 black strat with a maple board "V" neck and a single ply guard with all 63 marking and I know it was real. How did I know? The owner was the Fender east coast rep in 1963 and he got it new. This guitar is cherry and if you saw it and held it and knew where it came from, (The backwoods from the original owner) you wouldn't question it. Rodent, according to the Fender Bass Book, the transition block logo was first implemented in '64, not '66. Andrew, original logos were affixed above the finish until '69 where they finished over them. Still wondering if there's routed relief holes under the tuners or not. No relief holes. Just dents with a tiny space between the tuner plate and the back of the headstock. 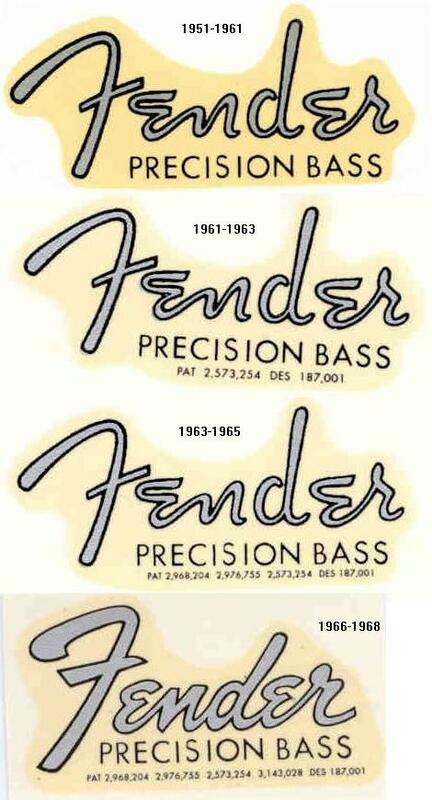 All the older right handed Fender P-bass Fender logo's I have seen back then were logo over finish.. or so it appeared. You could always see the outer edge seam.. but I am not a Fender collector so I will just sit idle and read the threads. All in all, it's a beautiful bass! Last edited by johnnyjellybean on April 18th, 2009, 7:49 am, edited 1 time in total. After all the conjecture, congrats on selling the bass! Well the congrats are premature. The buyer says it was bid on by "mistake" by his 5 year old son so it is back on the market. Bummer! Although five-year olds are great with most electronics these days, I think it's a stretch to think that a five-year old can read the steps and get to the bidding page on eBay to click accept! I think it's a stretch to think that a five-year old can read the steps and get to the bidding page on eBay to click accept! I agree 150% and thanks.